In the fall of 1865, the United States Army executed Confederate guerrilla Champ Ferguson for his role in murdering fifty-three loyal citizens of Kentucky and Tennessee during the Civil War. Long remembered as the most unforgiving and inglorious warrior of the Confederacy, Ferguson has often been dismissed by historians as a cold-blooded killer. Here, biographer Brian D. McKnight demonstrates how such a simple judgment ignores the complexity of this legendary character. 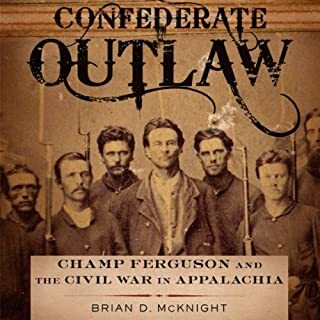 Would you listen to Confederate Outlaw: Champ Ferguson and the Civil War in Appalachia again? Why? Yes. I enjoy the civil war history and the book is well written and brings you into that era.I was familiar with the locations in Cumberland Gap the book talked about and that was cool to think about this story partly taking place there. I enjoyed reading about all the characters; not really a favorite. What does Alex L. Vincent bring to the story that you wouldn’t experience if you just read the book? The narrator has a very clear crisp tone and is pleasant to listen to. Brings life to the story. Sounds like he was well prepared in his reading.